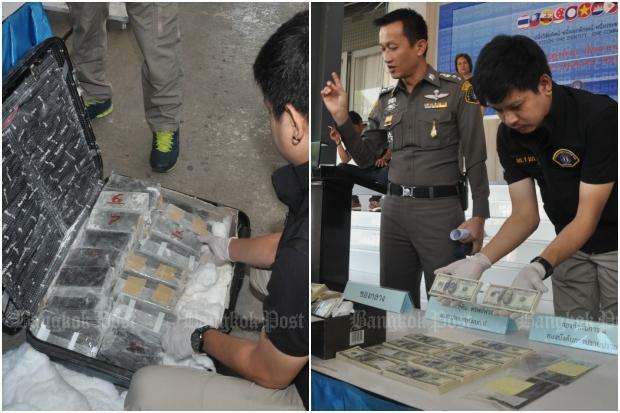 Police have seized counterfeit US currency with a face value of more than $150,000 (about 5.3 million baht) and arrested four Thais and a Cameroonian in coordinated sting operations with the US Secret Service. The Thai suspects are two women, Tatchanan Kunz, 48, Panissara Taechaissaiadej, 47, and two men, Kittipong Yanawattanapong, 43, and Natchapattarapong Yampradit, 55, the alleged gang leader. The Cameroonian man was identified as Jean Jules Tenker, 45. The arrests follow the expansion of the investigation following the recent arrest of Thai and foreign members of a gang passing counterfeit currency based in Bangkok’s Bang Kapi district. Thai investigators had coordinated with US Secret Service agents to investigate the source of the forged notes and people involved, said Pol Maj Nattapon Rattanamongkolsak, an inspector of Crime Suppression Division’s sub-division 1. CSD officers apprehended Mrs Tatchanan and Mr Tenker as they were delivering 300 bogus dollar notes hidden in a whiskey package to the undercover officer. A subsequent investigation led police to a Thai-Isan restaurant in Wang Thonglang district where Mrs Panissara and Mr Kittipong were waiting to receive their shares from the arrested suspects. Pol Maj Nattapon said all the suspects allegedly confessed they had acquired the counterfeit dollars from Mr Natchapattarapong, alias “Ajarn Tong”, who is a lecturer at a vocational college in Nakhon Ratchasima and owner of a company providing business counselling and planning services. Police later told Mrs Panissara to contact Mr Natchapattarapong and purchase more counterfeit money from him. The college lecturer was arrested at the car park of Town in Town Hotel in Wang Thonglang with 1,132 $100 notes in his possession. A search at his apartment room in Bang Kapi area found 30 bundles of US dollar note-sized paper coated in black and a gallon of an unknown chemical solution. Pol Maj Nattapon said the suspects allegedly admitted to trading the counterfeit green banknotes for several years without being caught, and that each member had a different role. The gang leader, Mr Natchapattarapong, spoke English well and he was responsible for coordinating with local and foreign middlemen, as well as closing deals for producing counterfeit money in different currencies. The group was charged with possession of counterfeit money with intent to use. Investigators are now looking to identify more people involved in the racket and find connections between the suspects and those who had been arrested earlier for similar offences. “We believe there is a production base [of counterfeit dollars] in Thailand and the fake notes are spreading in Bangkok and the Northeast,” Pol Maj Nattapon said. Pol Maj Nattapon said the operation seized a combined 1,534 $100 banknotes worth about 5.3 million baht and other evidence including two sheets of quotation papers, 13 photographs of counterfeit US dollar banknotes, 11 bank books and six mobile phones.